Happy Saint Patrick's Day! 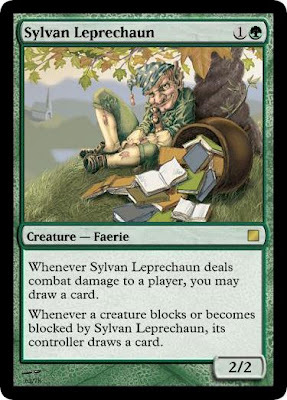 Here's a leprechaun. 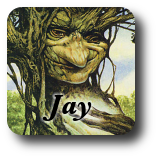 You don't see a lot of these guys in Magic and I'm pretty sure that's because they're not terribly distinct from gnomes (of the traditional variety), ouphes and brownies. That, and they tend to be more of the shenanigans variety than the heavy-combat variety. If you made it cost only G, it would be format-warping (in eternal formats), but maybe not broken. At 1G, it's cool, but probably not Constructed playable? Or maybe I'm underestimating the potential of a R/G deck that simply plans to blow up every possible blocker. It definitely hopes to be in the same environment as Unnatural Predation or Predator's Strike. While I get a kick out of the saboteur parallelism here (I get in, I get a card, I don't, you do), I think it's too redundant with the way that saboteur abilities play. When you have saboteurs you are encouraged to swing only when it can get through (or find some way to get through), and the 2nd ability just adds an exclamation point to that. "No, really, don't attack unless you can sneak through!" The fact that you can't chump with it at least adds something to the card (because typically that's the fate of saboteurs that can't get through anymore), and it further discourages players from letting the creature through in exchange for, say, preventing extra damage by blocking bigger creatures. But generally players don't want to let their opponents draw cards already, and this just unnecessarily heightens that (in that the player basically loses 2 cards in card advantage terms). However, I do like the idea of adding something else to the saboteur. What do you think of this guy? Whenever CARDNAME deals combat damage to a player, you may draw a card. Whenever CARDNAME becomes blocked, each player may draw a card. This would definitely play differently from your average saboteur. Whenever a creature dealt damage by CARDNAME is put into a graveyard from the battlefield, you may draw a card. I guess this card would really have to be UB. Whenever Open Source Spy deals combat damage, draw a card. Whenever a creature deals combat damage to Open Source Spy, its controller draws a card.